My daughter, Allison, is wearing her granny costume! 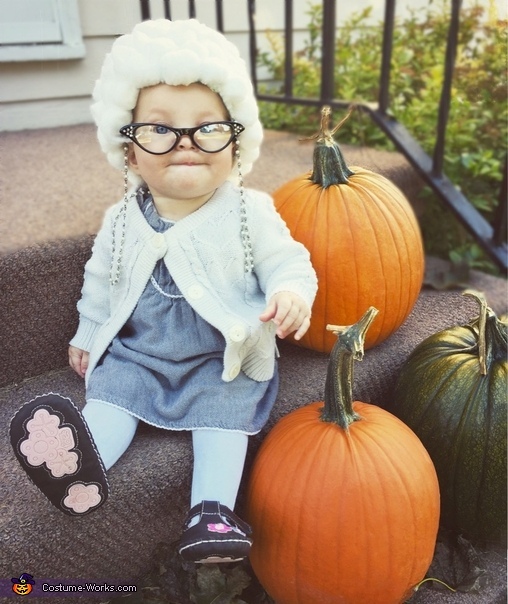 She is six months old, but decided to be 80 for her first Halloween! The idea came from Pinterest, but I wanted to incorporate pumpkins in my picture! I used an old winter hat, and hot glued white cotton balls all over it. I kept a towel in the hat while glueing, so it held the shape of a realistic head. I then bought infant costume glasses on Amazon, and broke apart a necklace to form into a string of pearls. I then knotted them on the glasses. I used a sweater, tights, a dress and shoes that Allison already owned. I held Elmo beside my camera so Alli would look my way:) she did great!